Removal of Cr(VI) from aqueous solution is performed by using Poly (AMPS-co-IA) hydrogels and their disassembled form and the results are compared. Optimum conditions of adsorption such as temperature and contact time was studied along with fundamental thermodynamic, kinetic and equilibrium studies. It was found that these hydrogels in both their forms do not require any external agent to maintain the acidic pH of the medium, which is the favourable condition for Cr(VI) removal. The ability of these hydrogels to retain the acidic pH was determined by Pzc studies. The pzc values were 2.4 and 3.0, respectively for disassembled and assembled hydrogels. The reason behind this acidic value was found as the presence of Sulphonic acid and Carboxylic acid functional groups in the molecular formula of the hydrogels. Qmax value were determined for assembled hydrogels as 250 mg/g and that for its disassembled counterpart it was raised to 333.3 mg/g. Desorption studies were carried out in order to estimate the reusability of the hydrogels. SEM, ToF-SIMS studies are reported. Poly (AMPS-co-IA) hydrogels, Mesoporous silica, Disassembly, Dual role, Cr(VI) removal, Pzc studies. Cr(VI) is a toxic, carcinogenic and mutagenic element that is usually found in effluents of tannery, metallurgical industries etc., [1,2]. It remains a challenge for the scientists, environmentalists and industrialists to make free such aqueous discharge from Cr(VI) impurities. Beginning with the usual daily activities of humans, cattle and a lot of agricultural activities are being threatened because of Cr(VI) impurity in the water. Hydrogels are widely applied in the purification of effluent at the pilot stage of inquiry. The adsorption ability of aromatic organic molecules of the polymer hydrogels , has provided a safer option for hydrogels adsorbents. For the purpose of removing harmful Cr(VI), adsorbents from polymer hydrogels sources like super absorbent hydrogels , magnetic hydrogels , poly (acrylamide-co-Maleic acid) hydrogels , cationic hydrogels with magnetic property  and poly (N, N′-dimethyl amino ethyl methacrylate) hydrogels  and bio-polymer like Chitosan beads  are found to be better adsorbents. The copolymer poly (AMPS-co-IA) hydrogels are proved to be a better adsorbent for removing the heavy metals like Pb2+, Ca2+ and Cu2+ in non-competitive manner  and Pb2+, Cu2+ and Cd2+ in a competitive manner . So far, efficient removal of Cr(VI) has been reported to have achieved preferably in the low pH range. Because, the process involving the removal of Cr(VI) from aqueous medium is strongly pH dependent and decreases with increase in pH [12,13]. Mineral acids, which are already corrosive and hazardous, are widely employed for maintaining low pH, particularly for the adsorption of Cr(VI) . These acids would become another threat to the environment, apart from the threat created by Cr(VI) heavy metals in aqueous solution. By using sulphonic acid as the key source of alternative modern acid to mineral acids, attempts were also made for finding a method which is free from the use of mineral acids [14,15]. But all these were ending with catalysis as the application, not extended to adsorption of heavy metals. Therefore, keeping in mind the above need, hydrogels made of Sulphonic acid as their chief component was used as the alternative for mineral acids for the purpose of maintaining a low pH in this method. In this study, the idea of disassembling poly (AMPS-co-IA) hydrogels into smaller pieces by the inclusion of Silica obtained from Pm, in-situ, in aqueous solution, is retained . The smaller size and larger surface area of irreversibly disassembled hydrogels induced the idea of comparing them with their assembled counterpart. Both the forms of assembled and disassembled hydrogels require no additional reagents for maintaining an acidic pH of the medium. This was confirmed by the Pzc (point of zero charge) values determined by salt introduction method . Therefore, adsorption studies were carried out for both assembled and disassembled hydrogels,independently, and the comparative results are reported. ToFSIMS, a surface sensitive technique, was used to as the additional tool for cross-verifying the adsorption result [18-20]. 2-Acrylamido-2-methyl-1-propane sulfonic acid (AMPS) (99%, Aldrich, India) m.p.194-196ºC and Itaconic acid (IA) (99%, Aldrich, India), m.p.166-167ºC, were used as the monomers. K2SO8 (99.99%, trace metals basis, Aldrich, India), m.p.99ºC, used as the initiator and N, Nmethylenebisacrylamide (MBA) (99%, Aldrich, India) m.p. 301-303ºC, used as the cross-linker. K2Cr2O7 (99.99%, trace metals basis, Aldrich, India) m.p. 398ºC, was used as the source for Cr(VI) ions. Poly (AMPS-co-IA) hydrogels were synthesized by means of radical co-polymerization . The procedure that was followed already by us is repeated  and described briefly as follows: 1.6560 g of AMPS and 0.2615 g of IA were crosslinked using 0.1540 g of MBA as the cross-linker and 0.0400 g of K2SO8 as free radical initiator and all the ingredients were calibrated to 10 mL measuring jar using de-ionized water. The contents were well mixed in a 250 mL beaker accompanied with a heating rate of 2ºC/min for about 15 minutes, stirred using a sterilized glass rod. After 24 hours of heating in the airoven at 50-55ºC, the hydrogels were used. The yield of hydrogels was about 89.l% and the remaining was treated as either uncross linked or water soluble. Pm husks obtained from the waste after feeding the Agapornis birds  was used after repeated washing with de-ionized water initially and then followed by 0.1 N HCl for five times. The husks were heated using a muffle furnace to 950ºC for 6 hrs to ensure the formation of white coloured ash, (Silica). The uniform Mesoporous nature of the resulting Silica obtained from Pm husk ashes have already been characterized and reported by us . In order to achieve disassembling of the Poly (AMPS-co-IA) hydrogels, mesoporous Silica obtained from Panicum miliare is being used as the composite material. The same quantity of AMPS, IA, K2SO8 and MBA as mentioned above along with 3% weight of Silica were dispersed  in de-ionized water, hence the whole dispersion was calibrated to 10 mL using a measuring jar. The purpose of including Silica was to study the influence of this material on the structure of the hydrogels. This dispersion was transferred into a clean 250 mL borosil beaker and heated on a heating plate at 2ºC/minute and stirred using a glass rod for about 15 minutes. All the Silica blended hydrogels were kept in a hot air oven for 24 hours at 50-55ºC to ensure the effective cross-linking. They were used as such removed from the oven for further studies. Morphological imaging of the hydrogels were examined by, SEM (JSM 561 OLV, JEOL). Concentration of Cr(VI) ions were determined by AAS (Varion, India), ToF-SIMS, was used for imaging and was acquired using a TRIFT-V nano-ToF instrument (ULVAC-Physical Electronics, Mn, USA) with 30 KeV Au+ primary ion source. The analysis area of 100 micron × 100 micron was randomly rastered by primary ions for the spectrum analysis. The primary ion dose was maintained at 2.9 E+13 ions/cm2 using a LMIG primary ion gun. Spectral acquisition was done with limited type and the 15.05 minutes was maintained as acquisition time. A low energy electron beam was used for charge compensation. A stock solution of exactly 1000 mg/L of Cr(VI) was prepared in de-ionized water using K2Cr2O7. Successive dilution was carried out for all of the working solution. The batch experiments were carried out in 100 mL Erlenmeyer Flasks by agitating with the adsorbents in 25 mL of the aqueous Cr(VI) solutions for a predetermined period at 28ºC on a water bathcum- mechanical shaker. The hydrogels, after adsorption, were isolated by a filter paper. The concentration of Cr(VI) was determined by AAS (Schimadzu). For determining linearity of response a standard plot of concentration of Cr(VI) as 1 ppm, 2 ppm, 3 ppm, 4 ppm and 5 ppm against the corresponding absorbance observed in AAS. The linearity of response was r2=0.997. Where, ‘C1’ and ‘C2’ are the concentrations of Cr(VI) before and after adsorption process, respectively. ‘V’ is the volume of the solution and ‘M’ is the weight of the hydrogels (g). The equations are obtained from conventional methods available in the literature . For the case of kinetic and equilibrium studies, non-linear fitting method was used for fitting the experimental values. In addition to the correlation coefficient, the model was also evaluated by average relative error function  (Equation 2), which measures the differences of the amount of the Cr(VI) taken by the adsorbent predicted by the models and the actual ‘q’ measured experimentally. Where, pHi = initial pH of the solution; pHii = final pH of the solution. A graph of pHi against ΔpH was plotted and Pzc was taken as the point where ΔpH=0. The values of Pzc were determined for assembled and disassembled hydrogels independently and reported in the Figure 1. The results show the relatively low Pzc value signals the predominance of positively-charged surface groups. The result shows the Pzc value for assembled hydrogels to be 3.0 and that for disassembled value to be 2.4. With this, information users desiring positive or negative surface charges to remove specific pollutants shall be able to adjust their pH values accordingly. The structure of hydrogels shows that at least three acidic groups, including one sulfonic acid and two carboxylic acids are available for each monomer hydrogels. During the process of swelling, hydrophilic functional groups such as -SO3 and –COOH in the chains contact each other by cross-linking . So, as the swelling take place, pH of the solution was decreasing progressively. Therefore, pH of the aqueous solution in the presence of poly (AMPS-co-IA) hydrogels is brought down to the acidic range, needless of the requirement for the introduction of external acidic agents . 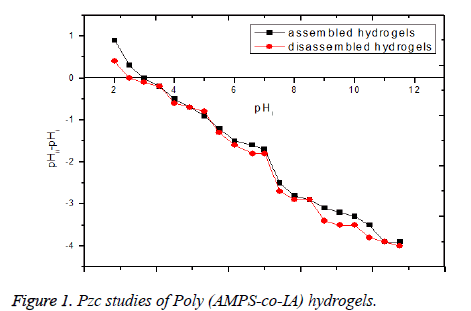 Figure 1: Pzc studies of Poly (AMPS-co-IA) hydrogels. This factor directly helps the Cr(VI) species to disguise into the HCrO4- form, which it prefers to exist, in the acidic pH range [20-22]. The very advantage of the presence of acidic groups on the hydrogels is that, the functional groups are chemically bonded to the hydrogels and hence will be retained even after several reuse. Moreover, there is no need to introduce severe acids for the purpose of maintaining low pH. The same kind of progressive decrease in pH of the aqueous medium was noted, even during the disassembly of hydrogels. It could be due to the exposure of hydrophilic groups during disassembly of hydrogels. An attempt was taken to distinguish the effect of assembled hydrogels and the disassembled hydrogels, by varying the percentage composition and the percentage Silica content, respectively. But no appreciable change was noted. The SEM images Figures 2a and 2b of the surface shows cracks and rough surfaces on the dried assembled and disassembled hydrogels respectively, which are suitable for the adsorption process. Figure 2: a) SEM image of assembled hydrogels. b) Disassembled hydrogels. ToF-SIMS measurements of the surfaces were separately performed with the adsorbed polymer hydrogels sample as well as with a similar hydrogels, without adsorption by the Cr(VI) metal ion (respective spectra are supplied with the electronic supplementary materials). In the case of ToF-SIMS image of poly (AMPS-co-IA) hydrogels, Cr(VI) counts on the hydrogels were counted as 33 out of total ion counts of 4515507 accounting to 0.0007% of the total ion available on the surface of the dried hydrogels. As the count is almost negligible, the metal ion is not supposed to be existing on this sample hydrogels. In the case of ToF-SIMS image of Cr(VI) adsorbed on assembled poly (AMPS-co-IA) hydrogels, The Cr(VI) on the polymer was counted as 1559 out of the total ion counts 1117844 accounting for 0.139% of the total ions existing on the surface of the dried assembled hydrogels. Whereas, in the case of the ToF-SIMS image of Cr(VI) adsorbed on disassembled poly (AMPS-co-IA) hydrogels, Cr(VI) on the surface of the polymer was counted as 8577 out of the total ion counts 4143271 accounting for 0.207% of the total ions existing on the surface of the dried disassembled hydrogels. The comparison between the two image analyses proves that the count of Cr(VI) on the dried disassembled hydrogels is higher and therefore, adsorption of Cr(VI) by disassembled poly (AMPS-co-IA) hydrogels should have also been higher than its assembled counterpart. In the case of ToF-SIMS mass spectrum of poly (AMPS-co-IA) hydrogels, which is free from Cr(VI) , the absence of metal ion on the surface is distinguishable by its unique characteristic isotope peaks at m/z 51.93, 52.92, 53.99, which are labelled with intense green peaks. On the other hand, in the ToF-SIMS mass spectrum of Cr(VI) adsorbed on assembled poly (AMPS-co-IA) hydrogels, the presence of Cr(VI) ion adsorbed on the surface was distinguishable by the peak at the same region. But the intensity of the Cr(VI) characteristic peaks were lesser, when compared with the intensity obtained for Cr(VI) adsorption on disassembled hydrogels. Especially, intensity of important isotope of Cr(VI) at 51.93 m/z on the dried assembled hydrogels is lesser than the intensity of Cr(VI) on disassembled one. This provides an additional evidence for the improved adsorption of Cr(VI) on disassembled hydrogels. Effect of initial pH of the medium: The effect of initial solution pH on the adsorption of Cr(VI) is an important aspect . For the assembled and disassembled hydrogels, it was determined by the use of 250 mg of the respective adsorbent with 50 ml of solution containing initial Cr(VI) metal ion concentration of 100 mg/L at various pH values ranging from 1.2 to 13. Figure 3 shows the variation of removal percentage of assembled and disassembled hydrogels for the adsorption of Cr(VI) ion as a function of pH. From the Figure 3, it is learned that the heavy metal removal is not greatly affected by the variation in pH until it is 8 for assembled and 9 for disassembled hydrogels. Figure 3: Effect of initial pH of the medium on adsorption capacity. The presence of sulfonic acid and carboxylic acid functional groups on the surface of the hydrogels makes possible to adsorb the Cr(VI) metal from aqueous medium, even if the pH is not exactly in the acidic range. 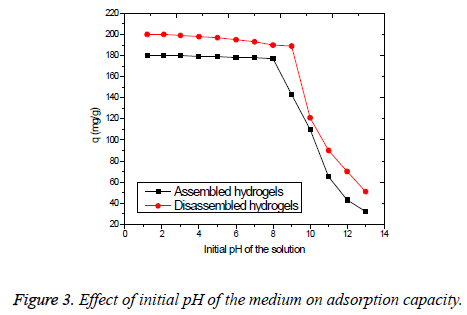 It can be seen from the graph showing the adsorption capacity of the disassembled hydrogels adsorbent was appreciable until the medium becomes too alkaline (pH=9). This is because of the increased exposure of the acidic groups towards the solution, than it was the case with assembled form. This proves that both assembled and disassembled forms of the hydrogels possess the pH regulating character, while the latter is better than its assembled form. Thermodynamic studies: Thermodynamic parameters for the adsorption of Cr(VI) on assembled hydrogels are listed in Table 1. The values of standard free energy change ΔGº, enthalpy change ΔHº and entropy change ΔSº were calculated using the equations (4) and (5). Table 1. Thermodynamic parameters of Cr(VI) adsorption on poly (AMPS-co-IA) hydrogels. A plot obtained from ln K0 vs. 1/T was found to be linear, the slope and intercept of it are used to determine the values of ΔHº and ΔSº. As it can be seen from the Table 1, the enthalpy change (22.56 KJ mol-1), implies the endothermic nature of the adsorption process and the product is energetically stable as well . However, the value obtained for entropy change is positive (77.88 J mol-1K-1) and that obtained from Gibb’s free energy is negative, showing the spontaneous nature of the adsorption process Cr(VI) on assembled hydrogels. In the case of disassembled hydrogels also, the positive value was obtained for enthalpy change (21.8 kJ mol-1). This implies the endothermic nature of the adsorption process, as it was with assembled hydrogels as the adsorbent. This fact was also seen in the effect of temperature in the adsorption of Cr(VI) on assembled hydrogels. Whereas, the value obtained for entropy change is positive (75.38 J mol-1K-1) and that obtained from Gibb’s free energy is negative, showing the spontaneous nature of the adsorption process. Table 2. Adsorption isotherm parameters for the adsorption of Cr(VI) . Where, ‘Ce’ is the equilibrium concentration in mgl-1, ‘qe’ is the amount adsorbed in mgg-1, ‘kf’ and ‘1/n’ are Freundlich constants related to adsorption capacity and intensity of adsorption, respectively. A linear relationship was observed when plotted between log qe and log Ce which indicates the applicability of the Freundlich equation to both assembled as well as disassembled hydrogels. The values of ‘1/n’ between 0.1 to 1.0 shows that adsorption of Cr(VI) on the hydrogels adsorbent is favourable . Freundlich isotherm fits best for the adsorption of Cr(VI) by assembled hydrogels. This is confirmed by the higher correlation coefficient (r2=0.983) and lower Ferror (0.0932). The adsorption sequence of Cr(VI) ions on these adsorbents was as follows: Disassembled hydrogels > assembled hydrogels. Factors such as smaller size and greater surface area of disassembled hydrogels, free energy of hydration and hydrated radii of the Cr(VI) ions are responsible for the observed variation in adsorption. The structure of hydrogels contain large amount of space filled with water in aqueous medium. The dissolved Cr(VI) ions have a greater possibility for getting into these spaces and get stayed there for a period of time. The only factor, which might be preventing Cr(VI) ions from being adsorbed by assembled or disassembled hydrogels, could be the size of the hydrated ion. As the Cr(VI) ions will exist anionic at this specific pH range, its size is expected to be greater. If the hydrated ion size is greater than that of the space available or the pores of the hydrogels surface upon which the adsorption takes place, the adsorbate may be excluded or few of the waters of hydration must be stripped from the solvated ions to enable them to enter. The assembled hydrogels have lesser exposure of surface than its disassembled counterpart. Naturally, this could be the reason for higher capacity of the disassembled hydrogels towards Cr(VI) adsorption. Where, ‘Qt’ is the amount of Cr(VI) adsorbed at a time and ‘k’ is the equilibrium rate constant (min−1). The rate constants (k) for each of the systems were calculated from the linear least square method and are given in Table 3. Table 3. Parameters for kinetic mechanism of Cr(VI) on poly (AMPSco- IA) hydrogels. The slope and intercept obtained for the linear plots of ‘t/q’ vs‘t’ curves were used to determine the rate constants. As it can be seen from Table 3, overall adsorption process fitted to the PSO model. This behaviour can be explained with the existence of chemisorption’s. Since, both the assembled and disassembled forms of poly (AMPS-co-IA) hydrogels have no difference in their chemical structure and bonding, the results of the kinetic models are fairly similar for both the adsorbents. At lower concentrations, adsorption kinetics also fitted to PFO (100 ppm) together with the PSO. Usually, for these adsorbents, PFO model is applicable to initial time course of the adsorption process but, it does not represent the overall kinetic range. For all initial concentrations, PSO fitted better with high coefficient of determination and resulted in reasonable theoretical and experimental ‘qe’ values. Effect of contact time: A compact picture of effect of contact time with assembled and disassembled hydrogels as the adsorbent with respect to the initial concentration of 100, 200 and 300 ppm of Cr(VI) is shown in Figure 4. In assembled hydrogels, concentrations of Cr(VI) ion in the residual solution was started to decrease at 25 minutes of contact time. Therefore, after 25 minutes of contact time, a steady state approximation was observed and a quasi-equilibrium situation was established and at 50 minutes the adsorption reached its maxima. The rate of Cr(VI) removal is found to be very rapid during the initial time course and thereafter, the rate of metal ions removal decreases. No significant change in metal ion removal is observed after about 50 minutes. It is also found that the adsorptive removal of the metal ions ceases after 60 minutes of contacting with the assembled hydrogels. During the beginning stage of adsorption, a large number of vacant surface sites are available on the assembled hydrogels. After having spent some time, the remaining vacant, unoccupied surface sites are difficult to be occupied due to repulsive forces that occur between the solute molecules on the solid surface and the bulk phase . Besides, the metal ions are adsorbed onto the swollen surface of the hydrogels that get almost saturated with Cr(VI) ions during the initial stage of adsorption. Thereafter, the Cr(VI) ions have to traverse farther and deeper into the hydrogels encountering much larger resistance offered by numerous forces. This results in the decreased optimum time of contact in the adsorption during the latter period of adsorption. On the other hand, when disassembled hydrogels were used, the removal of Cr(VI) ions from aqueous solution was started to increase from 5 minutes contact itself. This was because of the increased surface area of the adsorbent as the hydrogels were disassembled into small pieces which ensure maximum exposure of Cr(VI) ions at the earliest possible contact time. Also, the probability of Cr(VI) ions facing the adsorbents increases with an increase in the number of adsorbent entities. Therefore, after 5 minutes of contact time, a steady state approximation was observed and a quasi-equilibrium situation was observed and at 35 minutes the removal of Cr(VI) was maximum. There appeared no significant change in the Cr(VI) removal is observed after about 35 minutes. It is also found that the adsorptive removal of the Cr(VI) ceases after 40 minutes of contacting with the disassembled hydrogels. Figure 4: Effect of contact time. Effect of sand impurities: The adsorption process of real polluted water will possibly have the influence of sand, mud and other unwanted impurities, as interferences. It will become difficult to remove Cr(VI) ions existing in aqueous solution, if found along with some sand impurities. In this study, sand was introduced with varying size as shown in Table 4 and the corresponding percentage of Cr(VI) removal was noted in Figure 5. Sand was collected from the Pennar river shore, Cauvery river bed, Thirumalairajanur Estuary  and some form of sand during the rain deposit. As it is evident from the Figure 4 that the smaller the size of the sand, greater the disturbance for adsorption observed. This is valid for both assembled and disassembled forms of hydrogels. This is because smaller sands adsorb to the surface of the hydrogels in competition with the Cr(VI) ions . This competition is overcome by the increase in size of the sand in the disassembled form of hydrogels. Because, disassembled hydrogels cannot hold the sand or other particles which are larger than themselves. But the situation does not happen with assembled hydrogels since; bigger sized sand can also be adsorbed by assembled hydrogels to some extent. Therefore, the problem of sand impurity retains for the assembled hydrogels even with the coarse sand to a comparably greater extent than the disassembled. Table 4. Types of sand used for adsorption process. 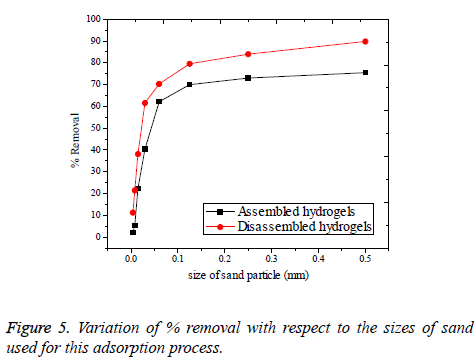 Figure 5: Variation of % removal with respect to the sizes of sand used for this adsorption process. Cr(VI) absorbed onto both the assembled and disassembled forms of Poly (AMPS-co-IA) hydrogels were desorbed independently, by con.HNO3. It was learned that the formation of Chromic acid, from the sorbed Cr(VI) in aqueous medium, is the driving force for the desorption of Cr(VI) from the surface of the polymer hydrogels . Every Cr(VI)-hydrogels samples were introduced into the conc.HNO3 and the resulting hydrogels, which is free from Cr(VI), was reused as adsorbent for further adsorption. However, the adsorbate Cr(VI) was collected in the form intense yellow coloured aqueous solution and was used as the source for Cr(VI). Adsorption-desorption cycle was continued for five times and the corresponding efficiency of polymer hydrogels was noted in the form of their %R as in the Figure 6. After five cycles, assembled polymer hydrogels were less efficient than disassembled hydrogels, ensuring it’s less compatibility towards desorption using conc.HNO3. This result further specifies the importance of disassembling the hydrogels. We conclude hereby, that both the assembled and disassembled forms of poly (AMPS-co-IA) hydrogels are efficient acidity regulators and adsorbents for the removal of Cr(VI) ion from aqueous solution. Based on the comparison of adsorption capacity for the known adsorbents for Cr(VI) adsorption both assembled and disassembled poly (AMPS-co-IA) hydrogels were found to be superior [20,31]. This is because of the abundance of acidic groups on the surface of this hydrogels. This abundance serves two important purposes: i) reducing the pH of the medium and thereby, ii) providing suitable atmosphere for the formation of anionic Cr(VI) species. The hydrogels adsorbent demonstrates high activity and selectivity in adsorbing important Cr(VI) species. Thermodynamic and equilibrium studies confirm the above fact. Qmax values for the removal of Cr(VI) using assembled hydrogels is 250 mg/g. However, it has become 333.33 mg/g when disassembled hydrogels was used as the adsorbent. Freundlich adsorption isotherm and PSO are found more appropriate, respectively equilibrium and kinetic models for the removal of Cr(VI) using both the forms of hydrogels. The optimum contact time was 50 minutes for assembled hydrogels but, it was found drastically reduced to 35 minutes with disassembled hydrogels. Sand impurities affect the disassembled form of the hydrogels to a lesser extent than that of the assembled hydrogels. Disassembled hydrogels were better to reuse after desorbing Cr(VI) by means of conc.HNO3 than its assembled hydrogels. In future, the disassembling method might be useful to improve the activity of hydrogels involved in the activities like drug delivery. Wise SS, Shaffiey F, Lacerte C, Goertz CEC, Dunn JL, Gulland F, Aboueissa AM, Zheng T, Wise JP. Particulate and Soluble Hexavalent Chromium are Cytotoxic and Genotoxic to Steller Sea Lion Lung Cells. Aquatic Toxicology 2009; 91: 329-335. Sougata S, Soumen D, Partha B, Tarasankar P. Redox-Responsive Copper(I) Metallogel: A Metal-Organic Hybrid Sorbent for Reductive Removal of Chromium (VI) from Aqueous Solution, Langmuir 2014; 30: 7833–7841. Xiao YH, Ying BC. Adsorption Properties of Chemical Cross-linked Polymer Gel, Advanced Materials Research 2009; 87: 22-26. Ankit MP, Ranjan GP, Manish P. Super Absorbent Hydrogel Based on Poly[Acrylamide Maleic acid/2-Methacryloxy Ethyl Trimethylammonium Chloride]: Synthesis, Characterization and their Application in the Removal of Chromium (VI) from Aqueous Solution. J Mac mole Sci 2011; 4: 339-347. TangSCN, Wang P, Yin K, Lo IMC. Synthesis and Application of Magnetic Hydrogel for Cr(VI) Removal from Contaminated Water. Environmental Engineering Science 2010; 27: 947-954. Bajpai SK, Susamma J. Poly(Acrylamide‐co‐Maleic acid) Hydrogels for Removal of Cr(VI) from Aqueous Solutions, Part 1: Synthesis and Swelling Characterization. J ApplPlmrSci 2006; 100: 2759 - 2769. Irene MC, Lo KY, Samuel CN. Combining Material Characterization with Single and Multi-oxyanion Adsorption for Mechanistic Study of Chromate Removal by Cationic Hydrogels.J EnviSci 2011; 23: 1004–1010. Weixia Z, Hang S, Kaifeng D, Hao Z, Hun Y. Rapid Removal of Cr(VI) ions from Aqueous Solutions by the Macroporous Poly(N, N′-dimethyl amino ethyl methacrylate) Hydrogels.J Pol Sci 2013; 128: 2729–2735. Wan Ngah WS .Adsorption of Chromium from Aqueous Solution using Chitosan Beads. Adsorption 2006; 12: 249-257. Çavuş S, Gürdaǧ G. Non-competitive Removal of Heavy Metals from Aqueous Solution by Poly (2-Acryl Amido Propane Sulfonic Acid-co-Itaconic Acid) Hydrogels. Industrial & Engineering Chemistry Research 2009; 48: 2652-2658. Selva Ç, Gülten G. Competitive Removal of Heavy Metals from Aqueous Solution by Poly (2-Acryl Amido Propane Sulfonic Acid-co-Itaconic Acid) HydrogelsPolymers for Advanced Technologies 2008; 19: 1209–1217. BartlettRJ. Chromium Cycling in Soils: Links, Gaps, and Methods, Environmental Health Perspectives 1991; 92: 17-24. Robert DM, Brian LM. 5-Chromium, Environmental Forensics Contaminant Specific Guide 2005; 4: 81-95. Xiaomin Z, Yaopeng Z, Shutao X, Yan Y, Jia L, Yingxu W, Qihua Y. Polystyrene Sulphonic Acid Resins with Enhanced Acid Strength via Macromolecular Self-assembly within Confined Nanospace, Nature communications 2014. Siril PF, Davison AD, Randhawa JK, Brown DR. Acid Strengths and Catalytic Activities of Sulfonic acid on Polymeric and Silica Supports. J MolCatal2007; 267: 72–78. Venkatesan S.In-situ Disassembling Behaviours of Composite Hydrogels for the Efficient Removal of Crystal Violet Dye from Aqueous Solution, ISRN Polymer Science 2014. Mahmood T. Comparison of different methods for the point of zero charge determination of NiO, IndEngChem Res 2011; 50: 10017. Alan MP. Salt Effects on Ion Formation in Desorption Mass Spectrometry: An Investigation into Role of Alkali Chlorides on Peak Suppression of Time of Flight Secondary Ion Mass Spectrometry, Analytical Chemistry 2009;81: 1040-1048. Ligang WU. Imaging and Differentiation of Mouse Embryo Tissues by ToF-SIMS, Int J Mass Spectr 2007; 260: 137–145. Young PK. Quantitative ToF-SIMS Study of Surface-Immobilized Streptavidin, Applied Surface Science 2006; 252: 6801–6804. Ramazan C, Ali D. Removal of Methylene Blue from Aqueous Solution by Competitive Removal of Heavy Metals from Aqueous Solution by Poly (2-Acryl Amidopropane Sulfonic Acid-co-Itaconic Acid) Hydrogels. Polymer Bulletin 2012; 68: 1889–1903. Venkatesan S. Synthesis of Mesoporous Silicon with Uniform Pore Size using the Ashes of Husks from Panicummiliare Millet: A Novel Recyclable Bio-waste, Silicon 2014. Langmuir I. Adsorption of Gases on Plain Surface of Glass Mica Platinum. Jof American Chemical Society 1918; 40: 1361–1403. Baikousi M. Synthesis and Characterization of γ-Fe2O3/Carbon Hybrids and Their Application in Removal of Hexavalent Chromium Ions from Aqueous Solutions. Langmuir 2012; 28: 3918–3930. Freundlich HMF. Über Die Adsorption in Lösungen, ZeitschriftFürPhysikalischeChemie (Leipzig) 1906; 57: 385–470. MckayG, Blair HS, Garden JR. Adsorption of dyes on Chitin. Equilibrium studies. JApldPolSci 1982; 27: 3043-3057. Lagergren S. About the Theory of so-called Adsorption of Soluble Substances, KuSven Vetens H1898; 24: 1–39. Ho YS, McKay G. Sorption of Dye from Aqueous Solution by Peat.ChemEng J 1998; 70: 115–124. Francoise R, Jean R, Kenneth S. Adsorption by powders and solids, Principles, methodology and applications, Academic press. 1999. Senapathi V. Distribution of Grain Size, Clay Mineralogy and Organic Matter of Surface Sediments from Thirumalairajanur Estuary,Tamilnadu, East Coast of India. Arab J G sci 2011. Jada A, Ait AkbourR. Adsorption and removal of organic dye at quartz sand-water interface, Oil & Gas Science and Technology – Rev. IFP Energies nouvelles. 2013. Bhattacharya AK. Adsorption, kinetics and equilibrium studies on removal of Cr(VI) from aqueous solutions using different low-cost adsorbents.ChemEngi J 2008; 137: 529–541.